This Quick-Fit Tap Connector allows you to easily attach a garden hose to an indoor kitchen, laundry or bathroom faucet. The brass adapter makes it suitable for taps with both male internal threads (0.84" diameter) and female external threads (0.95" diameter). The lever clamp mechanism enables a fast connection/release of the quick-click coupler attached to the hose. 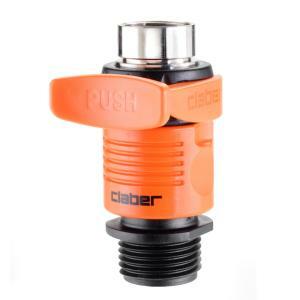 Handles water temperature up to 104° F. Made of UV-stabilized ABS and pom plastics. Unit is pressure tested for leaks at 145 PSI.